20 X 20 Stamped Steel Return Air Grille - White Discounts Apply ! This Return Air Grille has a sleek, clean look with a bright white finish. 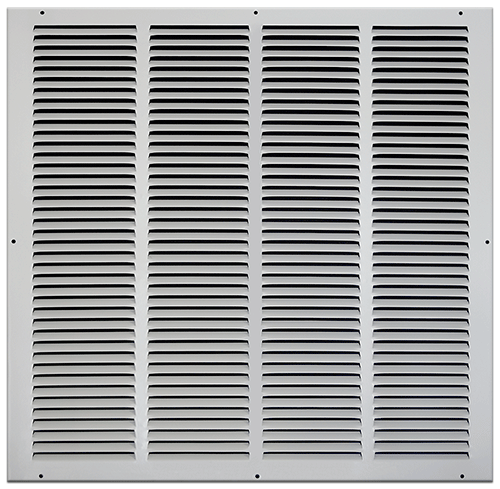 Constructed by the industry leader in home ventilation covers, you will find this stamped steel 20 x 20 inch return grille will look great in any style room. Functional, stylish, affordable, find out what a difference a new return grille will make on your walls. ***Hint: The industry standard is to order using the actual hole opening size and not the return grille faceplate size. This return air grille will fit a 20 x 20 inch hole opening. You can see the submittal drawing by clicking on the 2nd image.